How to examine the Pulse ? It is the expansion and elongation of arterial wall imparted by the column of blood and is passively produced by the pressure changes during the ventricular systole and diastole.Radial artery pulse is the one commonly examined this is the most accessible peripheral artery. What are the components of normal arterial pulse? What are the points to note in examination of pulse? 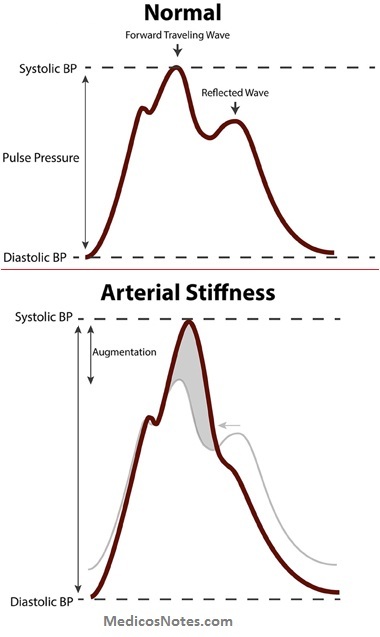 Pulse should always be described under these eiqht points. Condition ?f the vessel wall. Comparison between two radial pulses. Palpation of other peripheral arteries. How will you examine the pulse? The radial pulse at the wrist is generally examined using the pulp of three fingers (index, middle and ring linger). The patient’s forearm is held in semipronated position and the wrist is slightly flexed. Radial artery is used to palpate the rate and rhythm. How to count the Pulse rate? You should always count the beats for not less than half a minute but in a patient with arrhythmia, one must count the beats for at least one minute. Next Section : What are the variations in pulse rate?